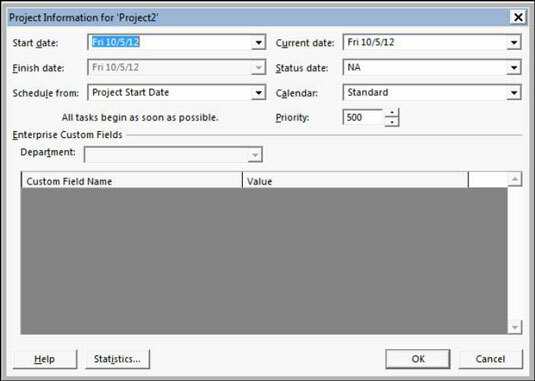 Once you open a blank project in Project 2013, you can begin entering basic project information, such as the start or end date, project titles, company name, and other relevant information. Choose the File→Info command. In the Project Information section on the right side of the screen, you can enter the start, finish, current, and status dates for the project. After choosing File→Info, you can click the Project Information down arrow to access advanced properties. Then enter your name, the project title, company name, keywords, and other information. This information is used in many of the automated reports that Project creates. 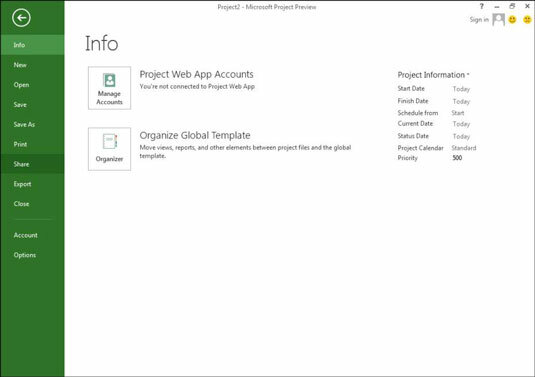 Choose Project and click the Project Information icon. You see the Project Information dialog box. It holds the same information as the Project Information section on the File menu. Start Date and Finish Date: For a project scheduled forward from the start date (see the next bullet), enter only the start date. Or if you schedule backward from the finish date, enter a finish date. Schedule From: You can choose to have tasks scheduled backward from the finish date or forward from the start date. Most folks move forward from the start date. Although you can schedule backward, use this feature only to schedule the work backward initially, by selecting the finish date and clicking the OK button. Immediately after doing so, return to this dialog box and revert to the (newly calculated) start date. If you don’t, you may encounter problems down the road if you eventually record progress. At that point, the end date will be fixed because you’ve backward-scheduled, and the start date will be fixed because you’ve recorded actuals, so the schedule will no longer be dynamic and won’t expand or contract. Current Date: By default, this setting matches the computer clock setting. However, you can change it so that it doesn’t match the computer clock setting. Changing this date is useful for looking at what-if scenarios or for tracking progress as of a certain date in the past or any date you choose. Status Date: You typically set the current date to track the progress on the project. When tracking, you usually want to see the status of the project as of the current moment, so you can ignore this setting. However, if you want to track as of the end of a fiscal period or another time frame, change it to track the status of tasks as of any other date. Calendar: Select from this drop-down list the Base calendar template to use for the Project calendar. Priority: This field is useful if your organization has many projects and you create links among them. If you use a tool such as resource leveling to resolve conflicts, it can consider this project priority setting when calculating what to delay and what to keep on track.